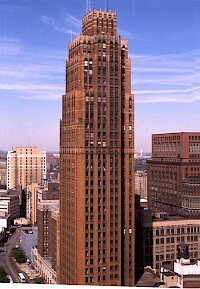 The David Stott Building is an Art Deco skyscraper in downtown Detroit, Michigan designed by the architectural firm of Donaldson and Meier. It was built in 1929 at the corner of Griswold Street and State Street (1150 Griswold St.), near Capitol Park. It is named after a businessman in Detroit who owned a mill and was on the boards of multiple other companies. It has 37 stories with three additional floors below street level.